We all know some things about Nepal - the Himalayas and Everest, the land of the Buddha, paradoxically also the land of the brave Gurkha soldiers, top adventure destination, almost the roof of the world. Nepal is all this, and more. It is a indeed a brilliant destination for those who like a bit of physical adventure and excitement, or simply crave being in the great outdoors. You can go on a short easy trek if you simply want a taste, or on a more adventurous, almost exploratory one. You can raft on snow-fed rivers, go on a safari, mountain bike across large parts of the country, or even go bungy jumping. You can watch the most awe-inspiring sunrises and the most brilliant sunsets as the sun moves across the highest mountains and deepest gorges in the world. You can see subtropical vegetation just days after you've been on a glacier or in a high-altitude desert. But you don't have to be an adrenaline junkie to visit. An equal part of the magic of Nepal lies in the diversity of culture, religion, and architecture to match the enormous diversity of landscape. The mix of Indian and Tibetan elements with the many indigenous cultures of Nepal make for people with hard-to-place features and religions so syncretic that Buddhism, animism, shamanism, and Hinduism all speak to each other. We live in flat stone-roofed houses with tiny windows in the mountains, in clever conical thatched huts in the lowlands, and around intricately carved wood and brick temples, palaces, and old residences in Kathmandu Valley's UNESCO World Heritage Site squares. As a modern nation, Nepal is barely 250 years old, and in some places you do wonder what century you're in, so timeless are the rhythms of everyday life, farming, herding, and worship. It hasn't been an easy transition into modernity politically or in terms of development, but the resilience and good cheer of Nepalis means that we face setbacks with composure and find alternative ways to improve our lives. There are many local initiatives around the country to improve education and bring electricity or water. In Nepal if traditional wooden turbines run stone mills, they are used, rather than discarded for something mindlessly modern, and in many places electricity often comes from solar panels. Snow leopards, among scores of exotic and rare animals, need to be conserved, so local people in the Everest and Annapurna regions have found innovative ways to protect their yak and sheep herds without harming the predators. We at Tin-Tin Trekking realise that, at the end of the day, all the information in the world is never going to match each individual's personal experience. Everyone carries away their own special picture of a place, and that is exactly what we are here to help you see. There is, of course, plenty of history before written records start. In the area we now call Nepal, there was one fierce, fighting dynasty, the Kirantis, that claimed Kathmandu Valley for over 25 generations. Around the 5th century BC, the first dynasty of 'Indian' origin moved in to claim Kathmandu Valley, the Licchavis. The early part of their reign coincides with the adoption by the renowned King Ashoka, who ruled over part of north, central, and east India, of Buddhist philosophy. Many of the edicts he had inscribed on stones and on pillars stand till today in part of Nepal including Kathmandu Valley and Lumbini. About six or seven centuries after the Licchavis came to power, their kings displayed increasing tolerance for non-Hindu religions including Buddhism, which is one of the hallmarks of modern Nepal too. The first written historical records specific to Nepali history date to the 5th century AD under the Licchavi king Manadeva, who took the influence of his dynasty beyond just Kathmandu Valley. Under King Amshuvarma, who came to the throne in the early 7th century, art and architecture flourished, social, monetary and administrative systems were codified, and cultural and political ties with China and Tibet strengthened, resulting in the first exchange of visits by official envoys. It was Bhrikuti, daughter of this king, who married the heir to the Tibetan throne and together with his Chinese wife, brought Buddhism to Tibet. Both these wives are in the Himalayan Buddhist pantheon as the White and Green Taras. Though with it also came the establishment of Kathmandu city and the acceptance of Tibetan tantric Buddhism, the last two centuries of the Licchavi era were ignominious, with excessive rivalry between the various clans, periodic wars with Tibet, and general political instability. The Mallas who followed in the 13th century, though beset by infighting, gave birth to some of the most stunning carved wood and brick architecture in the country. Under them agricultural economies flourished and trade with Tibet increased substantially. While they codified caste laws, they were also known for their tolerance of non-native religious practices, even allowing in the 17th century Jesuit Capuchin monks to settle in Kathmandu. Meanwhile in west Nepal, there had been a constant immigration of Rajputs from west India, the establishment of another major dynasty, the Sens in the mid-west, and eventually the movement eastwards, to Gorkha of the Rajputs, in search for new agricultural land and new areas to levy tax. All this came to a head in the mid-18th, when King Prithvi Narayan Shah, the tenth of the Rajput Shah kings, started eying Kathmandu Valley. He started by compromising the trade route with Tibet, which had until then paid for the Valley's military, strategically cut off the Valley's links with India, and eventually, with almost absurdly inadequate weapons, took over. By this time he ruled over much of what we recognise as Nepal today. It was Prithvi Narayan who coined a phrase that to this day is used to describe the particularly tight geopolitical position of Nepal: 'a yam between two stones' (China and India). Although there was, as always, some amount of infighting and assassinations here and there, by the early 19th century the Shah rule had even reached into parts of what is now Uttranchal in India. Not surprisingly, the British rulers of the subcontinent saw this Nepali expansion as land-grabbing, resulting in the 1815-16 Anglo-Nepali war. The Nepali army was defeated, but the British army was so impressed by its fearless fighters, that this was what sparked off British recruitment of Nepali soldiers ('Gurkhas'). Today British Gurkha soldiers have served with British troops in every major war. History in Nepal, particularly in recent centuries has repeated itself a number of times - coups, behind-the-back plotting and intrigue and on a couple of notable occasions, the killing at the same time of large parts of the line of succession. The rule of the Shahs was brought to an abrupt halt in 1846, when the suave prime minister Jung Bahadur Rana took over after orchestrating one such incident, relegating the monarchy to a purely ceremonial role. Jung Bahadur is best remembered for his trip to Europe, particularly France, where he picked up a taste for neo-classical architecture and rococo splendour indoors. Jung Bahadur tried to maintain cordial diplomatic relations with the British, even supplying troops to help fight the Mutiny of 1857. Ranas continued to maintain ties with the British, offering 100,000 soldiers in 1941 in exchange for Rs 1 million annually. There were, naturally, inevitable advances made under Rana rule, such as the introduction of modern education in the Valley, but there was also a dangerous nepotism and feudalism that became entrenched in the social fabric - all major commissions and positions of responsibility were occupied by Ranas, and accountability dwindled to the point where the burden on the exchequer, despite all the taxes levied, was almost unbearable, particularly after the massive earthquake of 1934 that devastated the Valley. This fiscal disaster together with Indian independence in 1947, which meant diminishing British influence and mounting pressure on the Ranas to release pro-democratic leaders and reinstate freedom of speech, enabled the nominal Shah king to regain control in 1951 with Indian support. Nepal has since then flirted with various kinds and degrees of democracy alternating with periods of absolute monarchy. Nepal is landlocked and, in comparison with its two closest neighbours China and India, small - just 800 m by 200 km. But don't let its size fool you. Nepal has probably the most diverse range of landscapes in the smallest area anywhere in the world. The process that formed the Himalayas which are, geographically speaking, only a small portion of Nepal, gave rise to several chains of lower-level hills that run across Nepal enclosing within them valleys that are, even if not high-altitude, still remote. There are four accepted physiographic divisions in Nepal. The southern strip of land that borders India and is bound on the north by the Churia (Siwalik in India) chain of hills is called the tarai. Once a vast malarial swamp, this well-drained, fertile area is now the agricultural and industrial centre of Nepal, though still predominantly rural. There are also dense forests here of sal and teak, and the lush variety of wildlife found in subtropical regions. The hills, where the terrain becomes rougher is in the west home only to subsistence farmers, though in the east of the country, where the monsoon has a greater impact, this belt is used in the cultivation of Nepal's famous Ilam tea. The western tarai is home to the indigenous Tharu people. The next belt, starting with the fossil-rich Churia range, which gives way to the higher Mahabharat (up to 2,500 m), is often considered the central part of the Nepal, and has the oldest established smaller and larger towns in the country, such as Kathmandu, Pokhara, Gorkha, Jumla, and Jiri. The traditional inhabitants of these areas, often valleys (sometimes called the inner tarai), have always been focused on trading (thus the old urban and semi-urban centres) and agriculture, terracing their steep but fertile hillsides to grow rice, vegetables, and wheat. In this region subtropical forests give way to spruce, fir, oak, pine, and cedar. Also native to this belt is the national flower, the rhododendron. The traditional local groups are Magars, Gurungs, Rais and Limbus. 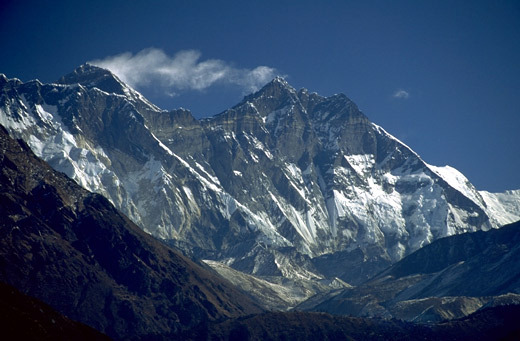 The high Himalaya, which in their entirety run over 2,500 km with a maximum width of 400 km, comprise under 8% of Nepal. Villages here are 3,000-4,000m, with summer pasture settlements going over 5,000 m. Here vast massifs, separated from each other by valleys, are home to eight of the world's ten highest peaks. The landscape and climate are not nearly as hospitable as lower down, but people continue to live up there and raise yaks and sheep, and even have one growing season a year - potatoes and barley. 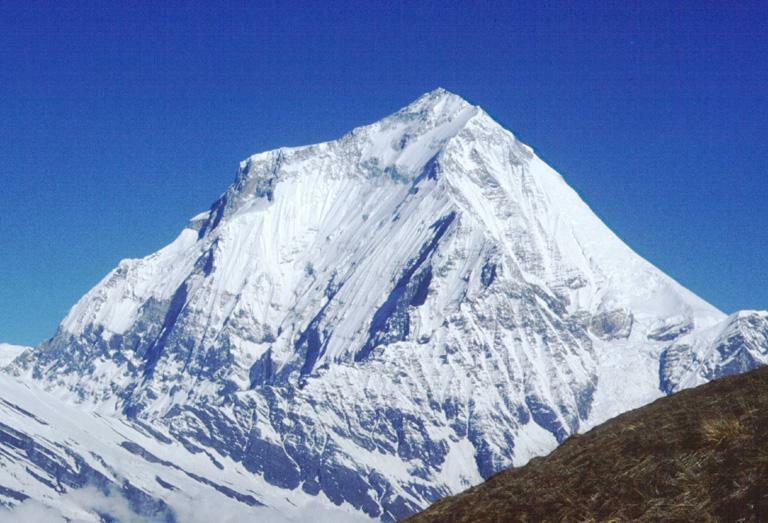 The Sherpas of the Everest region (Khumbu) are the most famous inhabitants of this area. 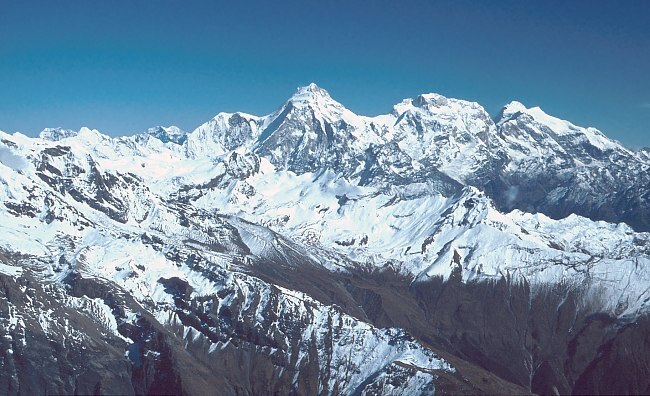 The trans-Himalaya is basically a high altitude desert, like the Tibetan plateau. The valleys of Mustang, Manang, and Dolpo, and parts of north-west Nepal all lie in the rain shadow. While there are a few occasional oases, the landscape in these parts of Nepal, as in Tibet, is almost lunar - stark hillsides, crumbling cliffs and a fine red-brown sand. The various snow-fed rivers that run north to south start in glaciers high in the mountains and come rushing down, carving the deep valleys that are the marker of the middle hills in Nepal. Snow melt combined with heavy monsoon rains can often cause flooding. But precisely because of their spunkiness and freshness, these rivers are among the most vaunted in the region for rafting trips. The various micro-climates of Nepal are all direct reflections of the country's diverse landscape. Starting south, the tarai and bordering Churia (Siwalik) hills have a climate much like the north Indian plains - subtropical monsoonal. This means that in the summer temperatures can pass the 40° mark, while in the winter they can hover around freezing. In what we call the central part of Nepal, temperatures can cross 35° in the summer and in the winter it is regularly below zero, with snow at higher altitudes. 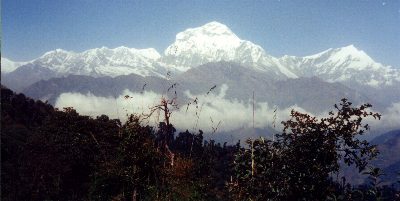 For example, neither Kathmandu Valley nor Pokhara get any snow, but the inhabited hills surrounding them do. 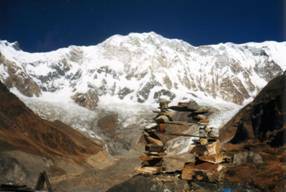 The high Himalaya, which is most parts of the Everest treks, have alpine climate and can be really very cold and snowy in the winter. The trans-Himalaya is warm but not in the summer, very cold in the winter and, most notably, dry. All of these high areas are in the rain-shadow, which means that while they get some precipitation throughout the year, they are predominantly dry. This makes life harder than even usual for those who live high up in the mountains, but there is a distinct advantage for the traveller - no monsoon means that you can trek in these places virtually all year round. At high altitudes as from late autumn through summer, it is extremely cold at night and you must be prepared. You need to always reckon with the possibility of snow, sometimes quite a lot of it. If you are equipped, this isn;t such a problem. On the odd occasion that trekkers have been snowed into their camp or lodge, they've found it quite an enjoyable experience. Nepal gets over 75 % of its precipitation in the monsoon, from mid-June through end-September. The south gets more rain than the north, and the east more than the west. That is why, doing the Annapurna Circuit, you will literally walk through a different landscape everyday, proceeding from subtropical to desert. To a lesser degree you see a similar change in the Everest region, too. The best times to be here are spring (March-April) and the post-monsoon autumn (Oct-Nov). The latter in particular makes for excellent travelling, with superbly clear skies (better for mountain views! ), little rain, and generally moderate temperatures. The nights are crisp and the landscape still lush from the life-giving monsoon rain. There is - and always has been - an enormous diversity of ethnic groups in Nepal - some say that in some parts of the midhills and above, each valley has its own distinctive group of people with different customs and language. It is roughly estimated that there are some 60 ethnic groups in Nepal. Half the 23.2 million Nepalis live in the tarai, and just over 10% in urban areas. Because so many parts of the country are too high to live in, or far too inhospitable, the population density is difficult to estimate, though the official figure stands at 140 people per sq km. 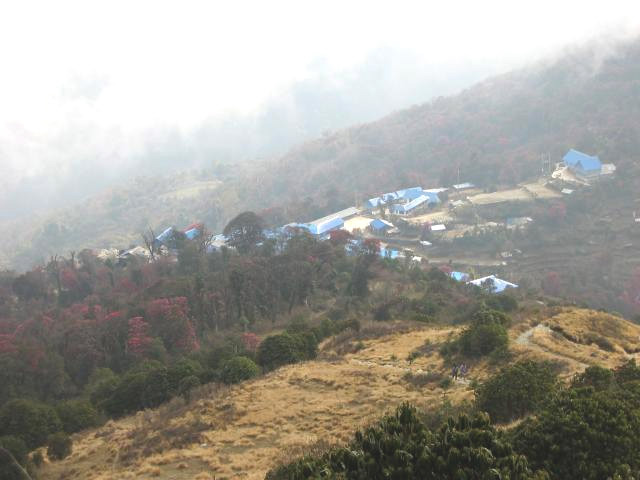 Although historically many different kinds of Nepalis have been intrepid traders, much like Tibetans, there is a huge number of people who might live anywhere from a day to a week away from the nearest road, who don't travel much except around neighbouring villages, and who truly source the large majority of their everyday needs from the land. Though it is the national language, Nepali is only the second language of over half of Nepalis. In the last (2002) census, over 90 distinct alive languages were recognised. Nepali itself is an Indo-European language with a Sanskrit base and that uses the Devanagiri script. The other major group of languages in Nepal is the Tibeto-Burman family, which includes most of the languages of the middle hills, the high and trans-Himalaya. English is spoken increasingly in urban centres and by some people on major trekking trails. Newars are the original inhabitants of Kathmandu Valley. They are renowned for their trading skills and cultural heritage - much craftsmanship in Nepal and Tibet is the work of Newars - but there are also many Newari government officers, and there is a farming subgroup too. Buddhism and Hinduism are often tightly intertwined in Newar culture, though there are some Newars who identify themselves exclusively as one or the other. Magars are the largest ethnic group in Nepal, and are found all over the country. They, too, can be both Hindu and Buddhist, though unlike Newars the Hindus employ Brahmin priests. Predominantly farmers, many Magars have also traditionally joined the Nepali, Indian, and British armies. Gurungs are from the Annapurna region, though there are settlements all over Nepal. Tibetan in origin, many Gurungs are now closer to mainstream Hindu culture, or use their own priests. Gurungs are either pastoralists and farmers, often in inaccessible little nooks, or armymen. There are many Gurungs in Hong Kong and Brunei, as a result, and many extremely well-spoken ex-soldiers along the trails. The Rais of the east are known for their sprawling villages, soldiering prowess, mutually unintelligible dialects, and facility with bamboo and allo (nettle used to make wonderful textiles). They are animists and shamanists, and their shamans, called dhami, are recognisable by their white outfits and ribbon festooned drums. Also of the east, the Limbus, like the Rais, are often soldiers. They speak a Tibeto-Burman language like most people of the middle hills and are also often involved in tea cultivation. Their best known contribution to Nepali culture is probably tongba, a potent fermented millet drink that is served in a capped metal container and sipped through a bamboo straw. Brahmins (Bahuns) and Chhetris, set up as the the first and second most authoritative castes in the Hindu hierarchy, look, when they are from the hills, more like light skinned Indians. Bahuns are traditionally priests, landowners, civil servants, and teachers, and very concerned about ritual pollution. Chhetris are known to be good soldiers, and much of the top brass of the Nepali army is Chhetri or some variation thereof, as are the Shah royalty and Rana nobility. 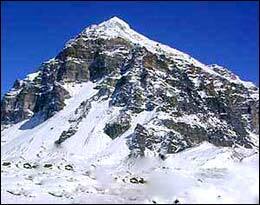 The Sherpas of east Nepal are almost synonymous with Nepal. Certainly not all are in the climbing or trekking business, though for many it continues to remain a viable, desirable career option. Of Tibetan stock (Shar-pa means 'people of the east' - of Tibet), Sherpas are devout Buddhists who often give of their prosperity to the many lamas (priests) and monasteries they patronise. Manangis, who live high in the Annapurna circuit are also closely related to Tibetans. In Nepal they are known for the special trading rights they have enjoyed for over two centuries. They continue to deal in precious and semi-precious stones, skins, and herbs, but more commonly in Chinese-made clothes, electronic items etc. Tharus are the largest ethnic group in the tarai, and are indigenous peoples. Tharu communities have long lived in thatched houses inside the jungle and had strong female figures in the family. 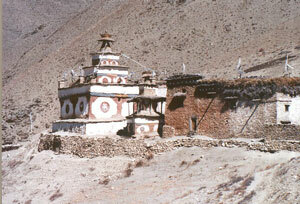 Other mountain communities include the Dolpopas in Dolpo region. Dolpopas are the most isolated of the Tibetan stock communities of Nepal. This is now being seen as an advantage particularly by scholars interested in customary modes of healing and doctors (amchi), as traditional Tibetan medicine is well-preserved and used in sophisticated ways in this area. There are other communities, generally occupational castes, some of them considered beyond the pale of the Hindu hierarchy ('untouchable', or more sensitively, dalit), such as Damai (tailors), Sarki (cobblers), Kami (blacksmiths) etc. Slowly but surely, caste barriers in Nepal, even in some not-so-remote villages, are coming down. Nepal is home to a sizeable Tibetan refugee population. Those who came down from the mountains into Kathmandu Valley are often very successful businessmen and producers of carpets. The Tibetan influence is seen in the Baudhanath stupa in particular. Nepal may be the 'only Hindu kingdom in the world', but it is also the birthplace of the Buddha. Nepal's long tradition of syncretic religion and tolerance is evident in people's everyday practice of religion and ritual as well as in the architecture and statuary in places of worship. It is common for a structure that appears to be, or is called, a (Hindu) temple to house manifestations of the Buddhist pantheon. Newars in particular combine both religions in their worship as well as architecture. In other parts of Nepal, Hinduism is sometimes merely the overlay for shamanism (as with Rais and Limbus) and animism (Gurungs). Often it is Buddhism that is underpinned by customary belief in the forces of nature (Tamangs). Sometimes all these are combined into something unrecognisable but anyway compelling, and obviously comforting to its practitioners. In many regions what we commonly call Buddhism is in fact an older Tibetan religion called Bön. A kind of animism, this nevertheless incorporates the ritual paraphernalia of Buddhism - upside down. 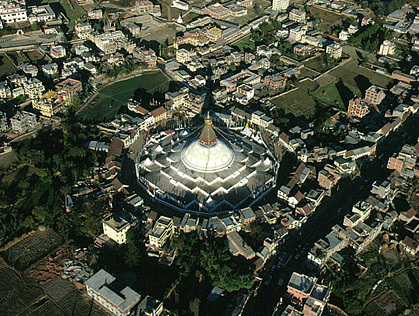 For example, they circumambulate a chhorten (also stupa, Buddhist place of worship, usually a solid dome pyramided towards the top inside which is houses a relic of a famous teacher or meditator) counter-clockwise. While Buddhists account for less than 10% of Nepal's population, it remains an important part of Nepali public culture and self-image. In general, Nepali and Tibetan Buddhists are of the Mahayana and Vajrayana paths, though some Newar Buddhists are of the Hinayana persuasion (close to the Theravada Buddhism of Sri Lanka and Thailand). In addition to the various kinds of animists and shamanists, there is a small Muslim population in Nepal, and an even smaller Christian one. Proselytisation is illegal and punishable by imprisonment. Although there are numerous local sacred spaces and temples, a few are standouts on any visit to Nepal. In Kathmandu are two Buddhist chhorten. Swayambhunath, which stands spectacularly on a hill north-west of Kathmandu, is supposed to have arisen out of the ground of its own volition. Sacred to both Hindus and Buddhists, it is considered to be of more importance to Buddhists such as Manangis and Tamangs. There are numerous little shrines all around that are visited by all. Baudhanath, one of the largest chhorten in the world, and one it is every Tibetan Buddhists dream to visit at least once, is the centre of Sherpa and Tibetan (refugee) culture in Nepal. This splendid stupa ringed by shops is reminiscent of the Jorkhang/ Barkhor in Lhasa, and is the focal point of a few score monasteries in the neighbourhood. The best known Hindu temple, considered the most sacred spot in the Valley, and certainly where the palace takes its religious guidance from is Pashupatinath. This pagoda-style temple, reminiscent of other temples around the Valley, is set in a massive shady grove through which the Bagmati flows. On a little hillside behind the main temple are numerous small shrines and covered meditation slabs. The most special site of religious devotion has to be Muktinath, at 3,800 m. A pagoda-style temple set in a wooded glade, this shrine is beloved by Hindus, Buddhists, and animists alike. What makes it special is that here three major elements co-exist in very close quarters. water flows out of an ancient stone, and an eternal flame hovers just above this very water. There are so many festivals in Nepal, all so different, and all so entrancing, it's worth planning your trip to catch a celebration somewhere in the country. The biggest (Hindu) festival is the ten-day long Dasain in October, which remembers the victory of the virtuous king Rama over the demon Ravana. There's praying, revelling, gambling, visiting, much eating and cooking of delicacies, and all kinds of other fun. The country virtually grinds to a halt, as for a large part of the festival banks and government offices are also closed. Meanwhile on the highways things are chaotic and festive as people rush back to their villages to celebrate with their families and ritually slaughter ducks, goats, chicken, buffaloes - whatever they can afford. Each of the ten days is dedicated to a different puja. Three weeks after the madness and fun that is Dasain comes the festival of lights, Tihar, which propitiates the goddess of wealth Laxmi - and siblings, crows, and dogs too. Little groups of boys and girls go around the Valley singing and being paid (off, usually). The city is light up by the thousands of oil lamps and fairy lights everyone sets out to welcome the goddess into their homes. And there's gambling too, lots of gambling. A Kathmandu Valley specialty in early September is Indra Jatra, an eight-day aila (homebrew) fuelled revel to propititate the god Indra to ensure good postmonsoon showers for a good rice harvest. The little Kumari ('living goddess') presides over some of the festivities, there are demon dances, and a river of potent Newari rice liquor flows from the mouth of one of the horrific-faced masks in Darbar Square. Lhosar, the Tibetan New Year falls close to the Chinese New Year in mid-February. For Buddhists other than Tibetans and Sherpas the date can fall anywhere from mid-December to March. There's plenty of visiting, eating, drinking and gambling, and also the more religious business of changing the prayer flags that devout Buddhists string up from their rooftops. At Baudhanath stupa, it's a life-affirming, light-filled few days with well-behaved crowds dressed to the nines. 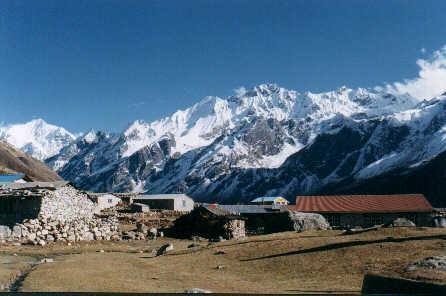 In the Everest region of Khumbu, it's worth catching the three-day Mani Rimdu in the village of Tengboche in November and Thame in May. In the monasteries the monks break out the gongs, cymbals, and scary dance masks. There are scores of other festivals, some widely celebrated, some local village traditions. One of especial interest is Gai Jatra (Cow Fiesta) in July/ August, which is to remember the dead of each family. But it's far from depressing. On this day you can mock, make fun of,slander, and generally defame and lie all you want. There is role reversal in schools, cross-dressing, and absolute, utterly funny, rubbish in the media. Every new moon it's worth visiting Baudhanath stupa to see them whitewash the massive dome and light scores of butter lamps. Also of interest are the Buddha's birthday in May, and the Dalai Lama's on July 6. The best known art form of the many practised in Nepal is thangka painting. Associated most with Tibetan Buddhism, this form uses pre-determined symbols and figures to tell various stories about the life of the Buddha and his many manifestations. Ideally the paints used are of a deep, dull sheen and made from stone and other natural materials. Less well-known, however, is that there is a native Nepali style of painting called paubha that many say was exported to Tibet, and heavily influenced thangka painting. Paubha is the preserve of Newari artists (from the Chitrakar sub-group) from Kathmandu Valley. It performs a similar function but looks visually quite different, exhibiting qualities you see in thangka, but also distinct Indian Hill and Mughal miniature influences. There's a burgeoning contemporary art scene in the capital, and Kathmandu and Patan are filled with galleries showcasing some innovative work. The artisans of Kathmandu Valley have for centuries been prized - Newari craftsmen worked on the great Buddhist structure at Borobodur in Java in 8th century. 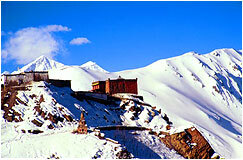 Their facility with wood and metallurgy also made them historically much valued in Tibet and China. 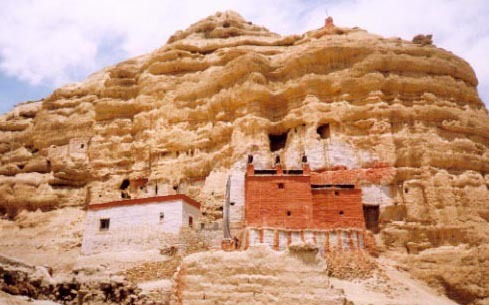 A large part of the credit for the numerous temples and other ancient structures in the Valley goes not only to the artisans and craftsmen who designed and executed the multi-layered roofs and elaborately carved struts and beams, but also to a man called Arniko, after whom the highway to Tibet today is named. Arniko was in the 13th century a consultant to the court in Tibet and then in Ming China. Traditional statuary abounds in stone as well as metal, with there being some truly innovative techniques in the latter, such as lost-wax casting. Unfortunately, a considerable part of Nepal's artistic heritage, which is nearly always in the public space in temples and the like, has been plundered and smuggled out and now rests in private western collections. In the last decade the scale of the problem has become smaller, thanks to increasing awareness of what this cultural loss means and therefore greater vigilance on the part of the guthis, or trusts that control temple premises. Nepal abounds in the softer arts, too. There are days when it seems like every Nepali can sing in the style of their particular ethnic group, whether it is improvised 'slanging matches', called dohori, or the lovely - and also improvised - call and response songs. The flute and the drum, women in devotion, bands of children carolling through the streets, street singers with their lutes, these are all sounds you hear far more often than you would imagine. There is more formal, 'classical' music (close to north Indian classical music) too. It's the same story with dance - every ethnic group has its own ways of swaying to the music, whether it relies more on hand-twirling, grinding down, line-dancing, or performing elaborate squatting-kicks. Newars have three forms of traditional dance, all of which are thankfully enjoying a revival now. Literature is flourishing in Nepal. Some might say it always has, with everyone from kings and queens, to small children revelling in writing poetry. There are some translations of Nepali-language prose and poetry in the bookshops; authors to look out for are Laxmi Prasad Devkota, Bala Krishna Sama, Bhupi Serchan, and Banira Giri. There is a younger generation of Nepalis who write in English, such as Samrat Upadhya and Majushree Thapa. There is still in Nepal a strong tradition of oral storytelling, especially around festival time and it's often interesting just to see how the (semi-)professional bards regale their audiences. High altitude takes on a new meaning when you learn that in Nepal the treeline is at about 5,000 m. At about this height, depending on which region you are in, and as long as it is not deepest winter, you can find rhododendrons and scores of other wildflowers, the grasslands that go even higher, as well as the more classic alpine-type of trees, such as juniper, spruce, birch, pine, fir, regular cedar and the unique Himalayan genus, deodar. As you go further down there are temperate forests, both upper and lower (1,500 m-3,000 m). Here are plenty of spreading oak trees, bamboo stands, chestnut, blue pine, walnut and maple. Flowers are aplenty, including rhododendron and magnolia, and on some treks you get to walk through forests that, slightly higher though they might be, are home to over 100 varieties of orchids. Nepal is a birdwatcher's paradise. Almost 10% of the world's birds are found here - that's over 800 species. Large scavengers are common in Kathmandu Valley - kites, vultures, hawks - though outside the city and in the surrounding hills you spot an enormous selection of the birds of Nepal. There are tiny, loud sunbirds, blue-throated Himalayan barbets, many varieties of pigeon, cranes, and pheasant, including the national bird, the Impeyan pheasant. In the high Himalaya watch out for lammergeier, ravens, eagles, and the like. Among the many rare and endangered species found in Nepal are the snow leopard in the high Himalaya and the tiger and rhino in the tarai. There are many kinds of deer, including the musk deer, monkeys, felines including the endangered leopard, crocodiles, snakes, and wild boar. Up in the high Himalaya you're more likely to see birds and the occasional marmot or blue sheep. A safari through the tarai is an excellent way to explore some of the spectacular wildlife of Nepal. National Parks, Conservation Areas, Wildlife Preserves, and Hunting Reserves: These designations depend on the fragility of an ecosystem, the rarity of the species that live within it, and the importance of the area to local people (did or do they live inside it, how much do they depend upon it for forest products, etc). Most of the touring and trekking you do in Nepal will be in some such area. All of them charge a fee, which we include in the cost of your trip. The fee is used to aid conservation and education efforts. The National Parks are, from west to east: Khaptad National Park (no trip), Rara National Park (trek), Royal Bardiya National Park (south, no trip??) Shey Phoksumdo National Park (trek), Royal Chitwan National Park (safari), Langtang National Park (trek), Sagarmatha National Park (Everest trek), Makalu-Barun National Park (trek). 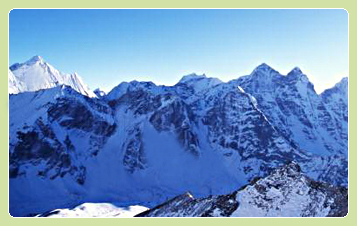 The Conservation Areas of Annapurna, Manaslu, and Kanchenjunga also have trekking possibilities. You will hear that Nepal's national meal is dal-bhat-tarkari - rice, lentil soup, and vegetables. That's true enough, but how little it tells! The main difference between Nepali food which described this way, sounds like Indian, is how light it is. There is no preponderance of spice, no heavy overcooking. The lush, full tastes of the lentils themselves, the vegetables, always with wilted greens on the side, onions, garlic, and sometimes ghiu (clarified butter) or a little cumin - that's the basis. but every community every village, every household has its own recipes for the dal, or for achar - freshly made conserves with radish, chili, roasted tomato or just about anything, spiced with ground sesame and mustard seeds or timur, the inordinately fragrant black peppercorn look-alike. There are things like gundruk - fermented and dried greens - and maseura - dried nuggets of black gram and vegetable - that are used to make the most delicious broths. In the hills of Nepal there is more to life than dal-bhat. Consider, for example, the potato. Sherpas happily eat entire meals consisting of boiled potatoes with salt and chilli powder on the side or their most appetising potato pancakes. Many mid-hill communities eat sisnu, stinging nettle soup - a very strange looking (neon-green) utterly delicious gravy, over grain cooked like polenta or grits, called dhido, which could be made of wheat, millet, corn or buckwheat. Nepalis love meat, and the Buddhist prohibition stands only for slaughter, and above certain places at particular times of the year, so mountain communities enjoy yak meat, fresh and dried, and all over Nepal people with a little spare money happily feast on buffalo (beef is sacred and cannot be slaughtered), mutton, chicken, fish (fresh and dried, all river) and duck. Tibetan-influenced food such as thukpa (noodle soup), fing (mung bean threads cooked with vegetables and meat), and sha-bhaley (a crusty cross between bread and pastry stuffed with meat and pan-fried) adds variety. The debate about the ubiquitous momo (wonderful steamed or fried wonton/ ravioli stuffed with chicken, pork, vegetables and many other new inventive things continues - do you like the classic version, pork lightly flavoured with ginger and scallions, served with a meat broth on the side? Thick covering or thin? Small or large? Heavily spiced with powders and herbs or mild and meaty? Are vegetarian momo sacrilegious? The little street-side momocha or fancy open Chinese-style sui mai? Another mischievous debate to start is ask people which momos they think are better: Tibetan or Newari. The most distinctive and sophisticated cuisine in Nepal has to be that of the Kathmandu Valley Newars. More than anything else these tastes remind you of where you are located geographically - near Tibet and Burma and Bengal - the dominant flavours are the tang of sour fruit extracts, the bright heat of chilli, liberal and innovative use of mustard and sesame, and the fresh flavours of uncooked ginger and garlic. The standouts include: a particular very spicy sour potato dish, piro aloo; achar with radish and small dried green peas spiced with mustard; aloo (potato) or sukuti (delicious dried buffalo meat) sandheko, a larb-like flavour explosion served cold after being marinated well with ginger, garlic, fried fenugreek seeds, tomatoes and green chilli; sekuwa, the traditionally spiced barbecue; chhoila and kachila, masterfully spiced dry-cooked meats, with the latter often 'cooked' through marination, rather than over fire; saag, regular wilted greens made magical by the infusion of crushed sesame seeds; and the subtly onion-and-basil seed flavoured nine-bean soup, kwanti. To wash down this embarrassment of riches all the ethnic/ indigenous communities have their own versions of homebrew. The two major kinds: distilled and clear, made from a variety of grains including rice and millet. The general name for this firewater is raksi, while Newars call their rice-brew aila. Up in the Jomosom area Thakalis prepare a deceptively coloured delicate pink raksi from bearded barley that is a great warmer. The fermented, milky beer-like booze is called jaand by Nepali-speakers and chhang by Tibetan-stock communities like Tamangs and Sherpas. While raksi can do your head in, you really must be careful with chhang, as it could cause gastro-intestinal problems and infections if not prepared hygienically. The smell, too, will be slowly leaving your pores for a couple of days. Up by the apple and apricot orchards of Marpha they have started to make European-style fruit brandy and schnapps, all going by the misleading name, Marpha. Some of this is really quite good. Needless to say, there is plenty of other good food, western and eastern, Italian and Japanese, available in Kathmandu. The same goes for drinks - there are local beers, many, such as Tuborg, Carlsberg and San Miguel brewed under license from European companies, and our very own Everest beer, as well as good local rum (Khukuri), vodka (Ruslan), and whisky (Mt Everest, naturally). Visas: Citizens of virtually all countries require a visa to enter Nepal. This can often be obtained on arrival at the airport for EU and North American citizens. On occasion the visa on arrival at the airport can be cheaper than in your home country. Check TKTK for updated visa regulations and fees, as well as to locate the consulate or embassy of Nepal closest to you. If you are applying for a visa on arrival or prior to departure, your passport must be valid for at least sic ore months, and you must carry a passport-sized photograph. A visa on arrival costs US$30 for 60 days, single entry, and $50 double entry. Permits: All tours and treks to areas designated as Conservation Areas, National Parks, or Restricted Areas require you to purchase a permit. It is in all cases cheaper to process this in Kathmandu at the concerned government office. Office hours are 1000-1500, and Saturdays are holidays. This means that if you arrive on Friday and depart for your trek or tour on Sunday, you need to provide us beforehand with a checklist of information, 4 passport size photos for Restricted Areas (Mustang, Manaslu, Dolpo), and two passport pictuers for other areas such as Annapurna, Everest, and Langtang. Usually, we will let you know in advance what we need, and also inform you of any government holidays or festivals that need to be factored in. Airport tax: Visitors must factor in an airport tax of Nepali Rs 1,795 for international flights out of Kathmandu, as well as NRs TKTK for each domestic flight. Reaching Kathmandu: From the time you land until you depart, we take care of whatever you need. What we cannot do is reserve your international flight. Discuss this with your travel agent at your end and do consider that if you fly via New Delhi or Bangkok, your flight options - and reliability - increase dramatically. Some of the best connections you can make are with Thai, Gulf, Qatar, Austrian (in season), Druk Air, Air China, Phuket Air, and other Indian and international airlines such as Indian Airlines, Lufthansa etc. 0930-1500, though some of the larger banks have one counter open in the city throughout the day and on all public holidays. Kantipath and Durbar Marg, close to the tourist and shopping centre of Thamel, house a number of banks including Standard Chartered (who issue cash advances against Visa and Mastercard with no commission), Nepal Investment Bank, and Nabil Bank. All through Thamel, open from 0800-2200, are money exchange counters that offer reasonable rates. There is no real tourist black market for foreign currency any more. 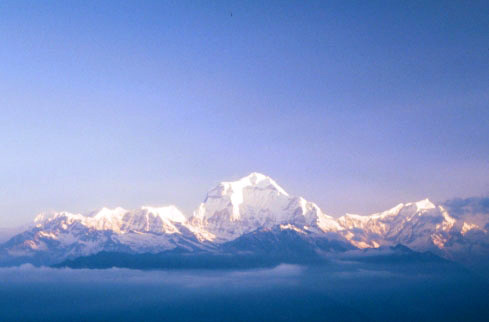 Weather: The best times to visit Nepal, particularly if trekking, are Sep-Dec and Feb-May. At these times of year, especially the autumn, the skies are a clear blue, flowers are in bloom, and walking is easy. Temperatures are moderate, with highs in the early-mid 20s and lows from 8-13 or so. Daytime clothing can be as light as a T-shirt and trousers, but nights can be chilly and require a sweater or a fleece jacket. Nepal gets the most of its rain in the monsoon from mid-June-September, so if travelling at this time it is wise to be well-prepared for rain, and not mind a leech or two out on the trails. It is entirely possible to trek through the winter, the only caveat being that you must be prepared for cold conditions and the off chance of being snowed into a lodge for a few days. Insurance : We strongly advise all our clients to purchase travel insurance at home before they leave for their trip. Those planning on trekking are advised additionally to make sure that their insurance covers the eventuality of a helicopter rescue/ evacuation to Kathmandu. Health care: No vaccinations are reuqired for travel to Nepal. There are a number of reputed hospitals in Kathmandu, and three clinics specifically for travellers. The best known is CIWEC on Darbar Marg, near the tourist and shopping centre Thamel. If going trekking above 3,000-3,500 m, ensure that all medical conditions are under control and that any medication you take will not interfere with Diamox, which is often administered to ease some of the symptoms of the acclimatisation process. Travelling in Nepal is safe, health-wise, and there is no reason you should fall prey to gastro-intestinal disorders if you take common sensible precautions with food, drink, and personal hygiene. Take particular care with water, and if bottled water is unavilable, drink only what you know has been sterilised, or do so yourself (carry water purification tablets with you). Hotel accommodation: Tin-Tin Trekking provides tourist standard accommodation in Kathmandu and Pokhara in hotels close to the agency as well as the tourist, recreation and shopping centres of Thamel and Lakeside. If, however, you wish to stay in a particular hotel or simply a different class of hotel, please let us know. We can usually arrange a discounted rate for our clients at most hotels. Check www.nepalhotels.com for more information. All hotels we organise will store your remaining baggage when you are on a trek or tour. Restaurants: In Kathmandu and Pokhara you will be accommodated in localities that house many different kinds of restaurants. We can direct you to usually reliable, clean restaurants in a variety of price ranges and catering to tastes ranging from traditional Nepali dal-bhat to steak. Just bear in mind that many restaurants in Kathmandu take last orders around 2100-2200; in Pokhara this is even earlier. Nanglo Restaurant, Durbar Marg. Good Nepali, continental, and Chinese, and excellent ambience. The Nepali set lunch is a good option in the aftermoon, as is the barbecue in the evening, under the sprawling tree. Lunch including drinks ca. $4-6 per person. Bhanchha Ghar, Kamaladi. Typical multicourse Nepali meal (set), set to tradional dance and music in an old building. Ca. $10 per head at dinner without drinks. Himalayan Java, Thamel entrance. Casual, many varieties of coffee, salads, sandwiches, $4-6 per head for snack/ light lunch or dinner. Fire and Ice, Thamel entrance. Legendary thin crust pizza, past, polenta, soft-serve ice-cream, Italian-owned and run. $5-10 per head with drink. Tibet Kitchen, Thamel. Excellent momos (Tibetan steamed ravioli), noodle soups and other traditional Tibetan dishes. Good dinner at $4-5 with drink. Tashi Dhele, Thamel. Old standby for hot, cheap meals, including good Tibetan and Mexican. $2-4, lunch or dinner with drink. New Orleans, Thamel. Good drinks, coffee, breakfast, interesting international menu, alfresco and covered. $2-10 with drink. Maya Cocktail Bar, Thamel. Excellent huge selection of cocktails, two-for-one happy hours, popular with all. $2-4 per drink. Picnic, Thamel. Excellent, spotless, value-for-money Korean, popular with all. $1-7 with drink. Closed 25th every month. Everest Steak House, Thamel. Excellent - and enormous - post-trek steaks with a variety of sauces. $4-8 with drink. Friendship Restaurant, Darbar Marg. Authentic Chinese chefs, clientele, and dishes. $2-8 with drink. Tamura, Hotel Kido, Thapathali. Japanese for Japanese visitors, expats, well-kept secret. $5-12 with drink. Gangri Sui Mai, Teku. Well-loved by locals for the open momos with four three sauces, and quality Chinese and Nepali meals. Lunch, dinner $2-4. Royal Lotus, Bakhundole Patan. Real Thai food. Prix-fixe lunch with drink $3-5. Tuesday closed. These are just a few suggestions to get you started; please do ask for more ideas. If you want to tip the staff, do so at the end of your trek or tour. These are only suggestions based on what people have found reasonable to give in the past. For guide/ sirdar and cook: Rs 100-200 per day for the group. For porters, Rs50-100 per day for the group. Shopping: Kathmandu is a shoppers' paradise. There is something for everybody, from adorable handknitted woollen outfits for children to trekking and climbing gear, from inexpensive silver jewellery to very expensive amber and turqouise, from thangka paintings (Buddhist religious art) to pashmina shawls, and great deals on cameras and cotton clothing. The key to not overpaying is not buying the first thing you see, no matter how much you like it. Look at similar merchandise in a couple more shops, compare prices and quality, and even try your hand at bargaining. Bargaining does not have to be hostile or exhausting - if you treat it as a game and don't try to beat people down to the lowest possible price - it's just a few rupees difference. Barring shoes, you should be able to buy a lot of items you need for your trek in Kathmandu. The quality of the imitation windstoppers, down jackets, Gore-Tex gear, and fleece gear varies, but it is possible to get quality products for a lower price than back home. If nothing else, most of the gear is suitable for at least one trek. Look out for the slightly more expensive - but original - Chinese-made branded gear from Mountain Hardware and North Face. These are worth the money. Also available at reasonable prices are original headlamps, high-performance socks, ski/ trekking poles, and some climbing gear and quality sunglasses. Photography and video: There is a surprisingly good range of film-based and digital still and video cameras, as well as accessories available, but to be on the safe side bring along whatever lenses, memory sticks and filters you anticipate needing. The etiquette for photographing people, images of gods and godesses, temples and other religious monuments is the same as anywhere in the world. Do ask if you're in doubt about whether it is okay or not. In places where you are instructed that photography is prohibited, please be sensitive to the requirement. For example, when at Pashupatinath temple, tourists are not allowed close to the cremation pyres. You might see some standing across the river taking pictures with telephoto lenses. In this case ask yourself if one mediocre picture is worth your intruding into someone else's grief, and decide for yourself. Beggars: In general begging is frowned upon in Nepal and there aren't many beggars, but tourist areas are the exception and there are a few. Please do not give them money. As you will see, a number of them, most noticably the young boys, are junkies, hooked on sniffing glue or slugging cough syrup. Your 'charity' will feed either their habit or that of their parents. It is perfectly okay to give them any food items you may have, ensuring however that you open the package before giving it. This is not as patronising as it sounds; it is a way to stop them selling it for a little cash to someone else and often then supporting their drug habit.